This is a cosy and welcoming apartment right in the centre of Pollença for up to 2 people + 1 extra. 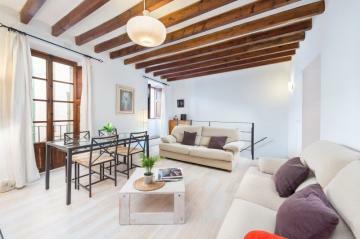 It is a 40 m2 apartment on a first floor with a room with a double bed and a bathroom with shower. There is a spacious and well lighted living room furnished with two comfortable sofas where you will be able to relax, surf the Internet (WIFI) and watch TV or a DVD. There is a really nice iron and glass table and chairs for 4 people.The cosy kitchen has everything you might need during your holiday: microwave, toaster, coffee machine, vitro ceramic hob, electric oven, fridge with freezer, etc. You will find as well washing machine, iron and ironing board. Please mind that pets are not allowed.Pollença is one of the most beautiful villages in northern Mallorca. It was one of the favourite places for painters and artists to settle in the island. Pollença invites you enjoying summer nights with its history, narrow streets and old traditions, there are also concerts around town, art exhibitions, bars, shops and restaurants in the main square with open air terraces that are always bustling. The most well-known sightseeing spots in Pollença are the roman bridge and the Calvari, which is a tiny church on the top of a hill in the middle of Pollença. You have to climb up 365 steps to get there but the views are really worth it!In a 15 minute drive you can quickly get to the beaches of Port de Pollença, Cala Sant Vicens and Formentor. All those are fine grained sand beaches with crystal clear waters and not really deep waters, what make them perfect for children. You can also join many sports and activities such as sailing, kayaking, diving or fishing. There is also the marina, where you will see all the luxury yachts and the colourful and tiny fishing boats from the locals. In the sea promenade you can delight yourself with the wonderful views from the bay while having a drink in one of the many cafes or restaurants you can find there. Pollença and Port de Pollença offer many shops with different kinds of local and hand made products. On Sundays there is market in Pollença and on Wednesdays in Port de Pollença, where you can get to know the locals.Distances:ATM, bakery, supermarket: 500 m – 1000 mBeach: 7.4 kmAirport: 59.7 kmTrain (Sa Pobla): 14.8 kmGolf course: 4.3 kmTourist license: L12E2542There's a mandatory tourist tax in Balearic Islands, called Ecotasa. All guests, except people under 16 years, have to pay this tax. The amount varies between 0.55€/night and guest during the low season and 2.2€/night and guest during the high season and is reduced by half from the 9th day for your stay. Guests will receive an email 7 days prior to arrival with mandatory general deposit payment information. The deposit is payable by credit card via a secure link within 24 hours after receiving the email. For more details, please contact the office using the information on the reservation confirmation received after booking.